The normal foot contains many nerves. The sole of the foot in particular is a very sensitive area due to its dense innervation. The medial and lateral plantar nerves (shown in the diagram below) supply these areas and protect our feet from painful trauma. A Morton’s neuroma occurs when one of the branches to the toes becomes painful and thickened. Medial and lateral plantar nerves to the sole of the foot (shown in yellow). Morton’s neuroma most commonly affects the nerve supplying the 3rd / 4th toes. The most common site for this problem is in the lateral branch of the medial plantar nerve that supplies the 3rd and 4th toes. The nerve becomes compressed in the space between the heads of the metatarsal bones and the soft tissue above / below. Often the history (description) and examination will allow a foot and ankle specialist to make a diagnosis without the need for further imaging such as ultrasound or MRI scans. A weightbearing xray is essential however to exclude other causes of foot pain. If there is any doubt, then an ultrasound scan (or occasionally an MRI if appropriate) can be helpful. The title image shows an ultrasound picture of a typical neuroma. Conservative treatment and the help of a good podiatrist can make a big difference to many people with a painful neuroma. If this fails to settle the problem, then treatment with an injection can be very helpful. An injection is quick and simple to administer and can be done at the same time as an outpatient appointment. We have found in Harrogate that about 60% of people who receive an injection in the outpatient clinic for a Morton’s neuroma do not need any additional treatment. We presented these results recently to the SICOT meeting in Rome. See the following links for more information. For patients with painful ankle arthritis, making the correct choice between treatment options can be difficult. It is often an intensely personal & individual decision. Ankle replacement patient information resources may be very helpful. They should supplement thorough discussions with your clinician. Good quality, balanced information about the different surgical treatments is essential. Adequate time to consider your options and the ability to have all your questions answered before arriving at a decision is essential. Mark Farndon offers regular opportunites for consultation and treatment via a Leeds Nuffield specialist foot & ankle clinic which will now be available weekly from December 2017. 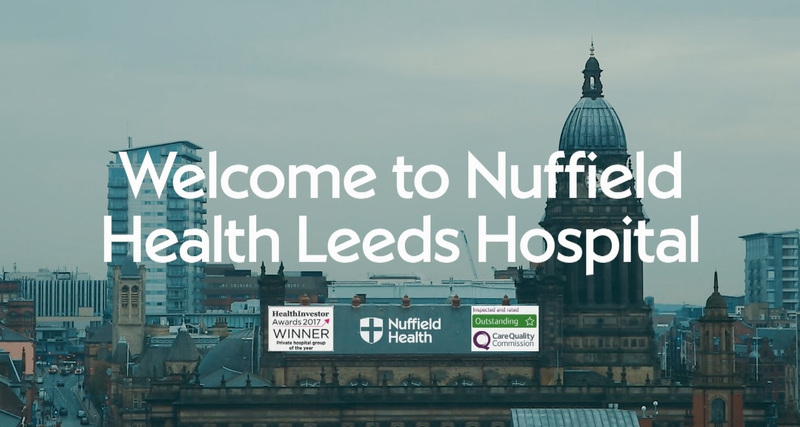 Private consultation and treatment are available in Leeds at the Nuffield Health Leeds Hospital. With an outstanding CQC inspection result, the excellent facilities are easily accessible close to Leeds city centre. NHS treatment is available at Harrogate District Hospital via a referral from your GP. Weight bearing xrays showing hallux valgus, with increased intermetatarsal angles and uncovering of the sesamoids. The diagram below shows the normal soft tissue balance around the big toe joint and the imbalanced bone and soft tissues that exist when a bunion is present. A combination of bony and soft tissue surgery is used to achieve correction. Post-operative xrays showing bilateral (simultaneous) bunion correction using scarf osteotomies to cut and reset the metatarsals. The intermetatarsal angles are corrected to normal range, the sesamoids are reduced beneath the metatarsal heads and the hallux valgus is corrected. This surgery is usually undertaken as a day case procedure, under a brief general anaesthetic, with a long acting ankle nerve block to keep the foot comfortable. After bunion surgery in Leeds & Harrogate undertaken by Mark Farndon, patients are allowed to weight bear in a protective Podalux shoe immediately after surgery, though are advised to elevate the foot / feet as much as possible for the first two weeks to allow wound healing and to let any swelling settle. Mark Farndon is a experienced foot and ankle surgeon specialising in arthroscopic ankle fusion and total ankle replacement surgery in Leeds and Harrogate. Harrogate & District NHS Foundation Trust are participating in the national Arthritis UK OARS Study, collecting patient outcome data in individuals undergoing total ankle replacement surgery. Mark Farndon and David Lavalette have consistently used the Corin Zenith Total Ankle Replacement with good results. After falling several hundred feet whilst climbing near Chamonix, Phil Burgess sustained injuries to his neck, back and ankle. His spinal injuries were treated successfully conservatively with bracing. His ankle injury was treated promptly with surgery in France, though the reconstruction of the ankle joint and syndesmosis was inadequate, necessitating revision syndesmosis reconstruction. Phil sought a second opinion following his return to the UK, six weeks after the initial accident and surgery. Revision reconstruction of the syndesmosis was advised. “I suffered a severe dislocation after a major climbing fall in the Alps. My ankle was pinned but unsuccessfully by medics in France and after a period of delay I turned to Mark for a second opinion. He was clear that I needed further immediate revision syndesmosis surgery, explained the action fully and accelerated my procedure to suit my personal circumstances. The operation has given me the best possible chance of normal ankle use. Removal of metalwork, open reduction of the syndesmosis and repair of the deltoid ligament and stabilisation with a combination of screw and suture button ‘tightrope’ fixation were required. In 2012 I sustained a Lisfranc injury to my left foot resulting in dislocation of the midfoot joints. Mark Farndon performed the operation to fix the bones back in place with plates and screws. So good was the surgery that I was up and about riding and back to the sport I love within 3 months, when other specialists had told me that this injury would end my career. I found the outpatient care above and beyond, and it’s so refreshing to have a Surgeon that makes you feel so at ease in every consultation leaving me with 100% trust in his knowledge and guidance.